Today is National Cabernet Day and all I can think about is steak. Or, I guess, steakhouse food. My favorite way to begin a steak and potato heavy meal is with a Caesar salad. Not one of those topped with chicken, which is a meal in and of itself, but just simply dressed lettuce with a handful of Parmesan curls on top and some homemade garlic croutons — that is if I’ve planned well enough ahead of time (I didn’t). I like this version of Caesar dressing because it’s made with ingredients I always have on hand — an egg yolk, Worcestershire sauce (in place of anchovies), garlic, Dijon, olive oil, vinegar — and comes together in about five minutes. It always amazes me how many different dressing flavors and textures you can get out of a few, shelf-stable ingredients plus a handful of seasonings and the occasional egg yolk. Mind boggling. Anyway, come back later when I’ll share a recipe for steak and au gratin potatoes. Today’s steakhouse meal is a multicourse, multi-meal ordeal — don’t forget the wine! Between the raw garlic and black pepper this dressing packs some heat. Eliminate the 1/4 teaspoon ground black pepper from the dressing if you prefer a less spicy dressing. In a small bowl, whisk together egg yolk through salt (by hand, no machines necessary) until thickened slightly (about 30 seconds to a minute). Whisking constantly and vigorously, slowly drizzle the oil into the egg yolk mixture. If the mixture appears to be separating, stop pouring oil and whisk until the oil is absorbed. Once all of the oil is incorporated, whisk in vinegar; season to taste with additional salt and pepper. Use immediately or transfer to a clean jar or bowl, cover and refrigerate for up to two days. 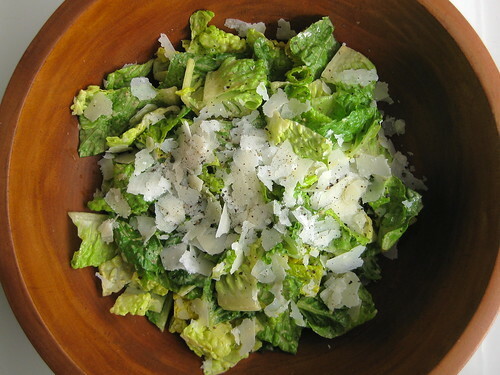 In a large bowl, toss together dressing and lettuce. If desired, transfer to a clean serving bowl or individual bowls. Top with Parmesan, freshly ground pepper and garlic croutons (if using). Serve immediately.